Savor the flavor and beauty of this four-stack masterpiece including Gail Pittman collectible tin. 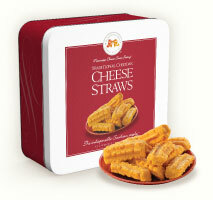 FOUR POUNDS of delicious straws and cookies!Includes:• 2018 Gail Pittman Collectible Gift Tin• Traditional Cheddar Cheese Straws 16 oz. Gift Tin• Original Lemon Straws 16 oz. Gift Tin• Mudpuppies 16 oz. Gift Tin. NEW! Drum roll, please! A huge and hugely adorable drum packed with goodies! Includes: • 2018 Gail Pittman Gift Tin • Original Lemon Straws 6.5 oz. • Sriracha Cheese Straws 3.5 oz. • Mudpuppies 1 oz. !